Continuing progress on board PS Medway Queen. 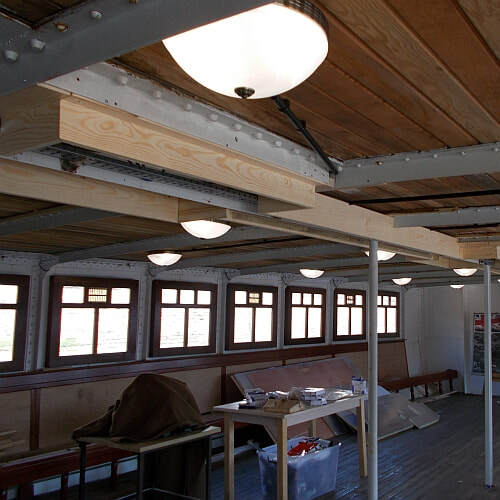 Work continues on board the ship in the aft saloon and elsewhere. 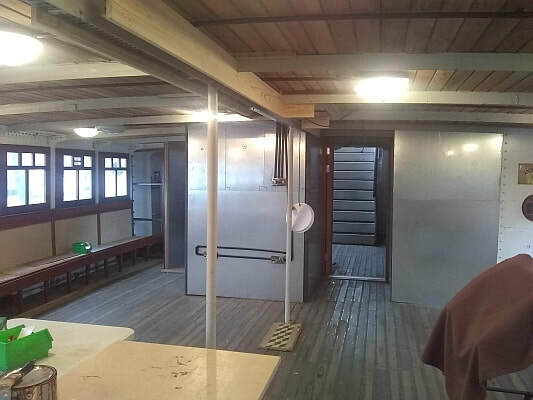 The new deck-house (top left) for the aft companionway will be installed soon, The engine room is being given a tidy up (Top and bottom centre) and temporary decking laid to improve access. In the saloon work has started on the deck head (top right). Among all this activity,"Woody" has found time to make this beautiful coffee table (bottom left) from original deck timber off-cuts and to celebrate his 83rd birthday with some of the other volunteers (bottom right). 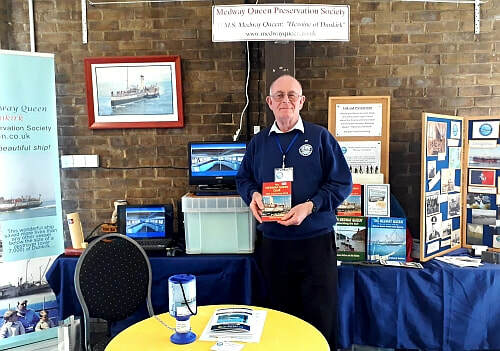 Work on board Medway Queen is progressing by leaps and bounds thanks to the generosity of our members and others and to the hard graft put in by volunteers and contractors alike. 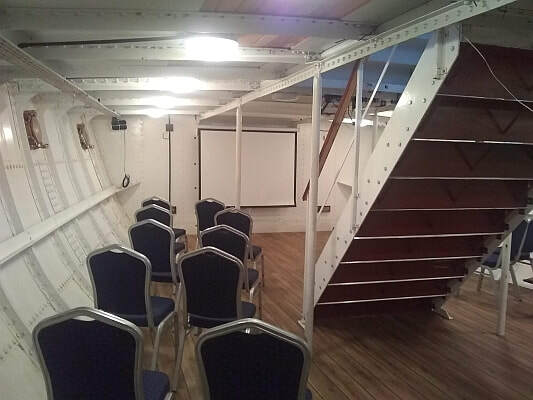 Electrical services have been upgraded and new fittings installed, the upper aft saloon is becoming a separate space within the ship with necessary fire protection. A first batch of cushions for the bench seats have been tried out and put into safe storage while work continues. 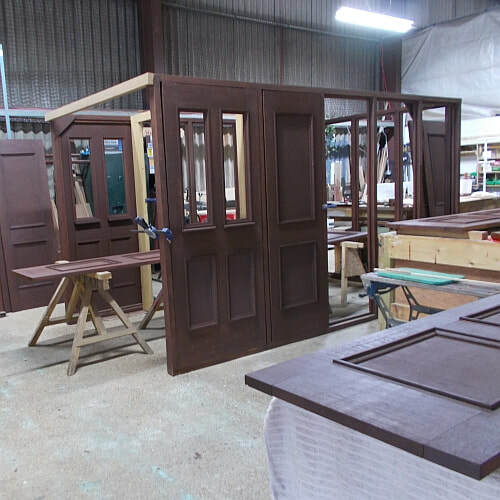 The forward saloons have been spruced up and work should be under way on the galley any time now. The pictures speak for themselves. During the week the ship is a place of work and closed to visitors but she is open on Saturdays from 11am to 4pm (last admissions 3pm) so come down and see the progress first hand. Once this phase of work is complete we will be able to hire out the space and generate a revenue stream that will help towards further restoration. 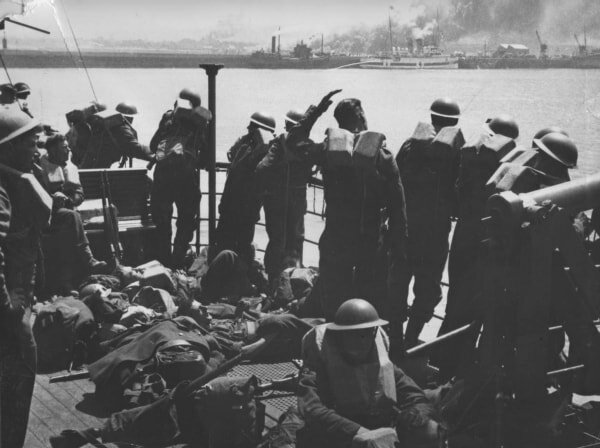 Our knowledge of HMS Medway Queen's part in Operation Dynamo is increasing all the time. In addition to Jack Skinner's first hand accounts mentioned in a previous post we have now added more names to our survivors list. W.J.C. Fuller was a Lieutenant on HMS Brighton Belle. He was picked up by Medway Queen when Brighton Belle sank on May 28th. His grandson has copied some notes for us and the (false) press reports of MQ being sunk during Operation Dynamo. Oliver Clifford was a lance Corporal in the RASC and was rescued from Dunkirk by HMS Medway Queen, although we do not have the date he was picked up. Ronald Arthur Medhust was a Lance Corporal in the Royal Army Medical Corps. He too was picked up by MQ but, again, we do not have details of date etc. Some time ago now Paul Martin and his team filmed some "Flogit!” (antiques programme) episodes in Rochester Cathedral. I think they filmed 2 episodes. Each episode includes a visit to a local site of historic interest, one of which was Medway Queen at Gillingham Pier. The other one, featuring Chatham Dockyard, was shown recently. Although we have not had any notification I think the "Medway Queen" episode is coming up shortly. According to my TV listings this coming Friday’s episode is also from Rochester Cathedral, and not billed as a repeat, so it could be the one with a half time visit to Medway Queen.